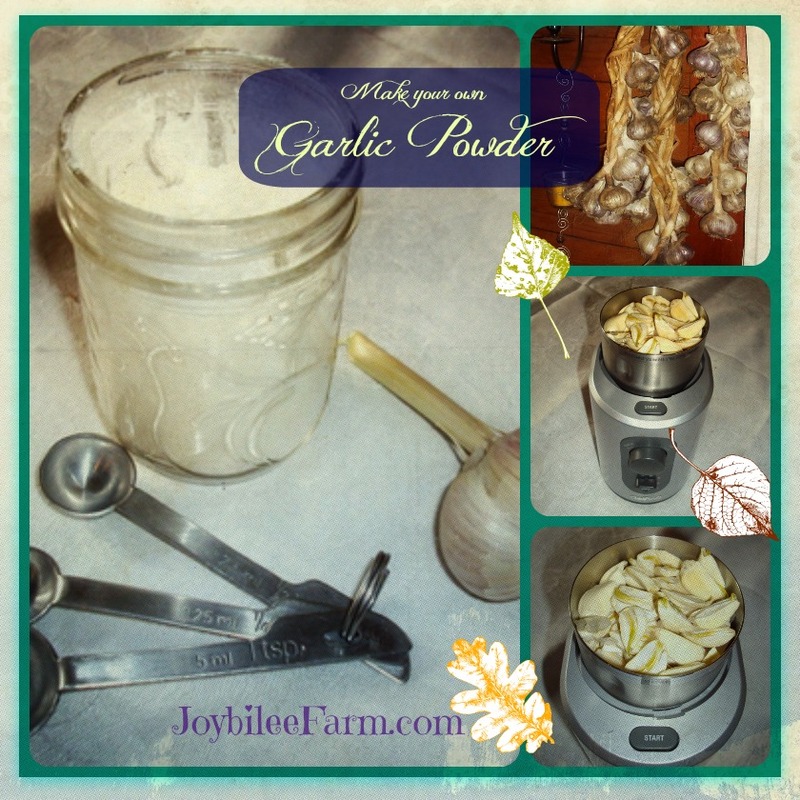 You can make your own garlic powder easily. So you’ve grown your own garlic by planting in October. You’ve weeded and pinched off the scapes in June and July. You’ve harvested the garlic when the leaves are 2/3rds yellow and one third green and the garlic heads are still tight. You’ve braided the garlic in braids of 12 heads and hardened it off, by hanging it in a cool, dry place for a few months. When the new garlic came in, your garlic braids from last year still had a few heads of garlic that you didn’t use. Don’t toss last year’s harvest when the new harvest comes in. Instead make garlic powder from last year’s cloves. 1. Separate the cloves of garlic from each head. Peel each one. 2. Lay the garlic cloves on your dehydrator trays and dry until crisp and brittle. Your garlic will remain raw as it dries and is good for medicinal use, too. 3. Allow to cool completely. 4. Using a spice grinder or a coffee grinder, grind the dried garlic cloves into a fine powder. You may need to allow your grinder to rest between batches, if you have a lot of garlic to grind. 5. Store your delicious ground garlic in a mason jar with a tight fitting lid. Use it in place of commercial spices. Yours will be more flavourful than commercial garlic powder. Use it to fill capsules for medicinal use. It helps lower blood pressure naturally and improves your immunity. Since you dried it at home at a low temperature you know that it is still raw and has preserved all the medicinal quality of raw garlic. Add it to salad dressings and spice mixes. Stir it into soup stock. You can do this and your homemade garlic powder will be so much more healthful and flavourful than anything that you can buy in the store. Is it necessary to grind the dried cloves? Could they be cut in half, dried thoroughly, and stored as is? 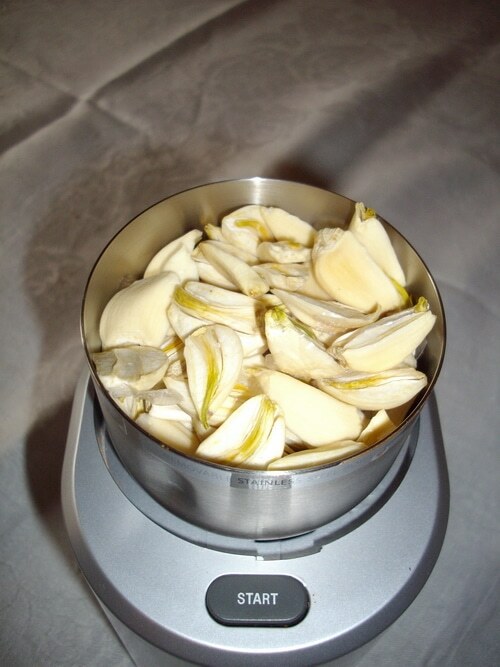 Then toss into soup or… If you don’t like to eat a large chunk of garlic, it could be removed like bay leaves are. Of course. Drying the cloves as wholes or halves and using them that way is perfectly in order. I grind my heads into a paste and then put into the dehydrator. When it’s dried I put that in the food processor to powder. Thanks for the great idea. I’m hoping to plant garlic this fall for the first time! What kind of dehydrator do you use? Do you need to cut in half large cloves to dehydrate evenly? I cut my cloves in half just to speed the drying time. The cut side dehydrates quicker than leaving them whole. It also helps them grind faster and with less lumps. They will dry if you don’t cut them, though, it just takes longer.